Two tries apiece, and territory and possession evenly shared, this was the proverbial grasshopper’s hamstring of a game. 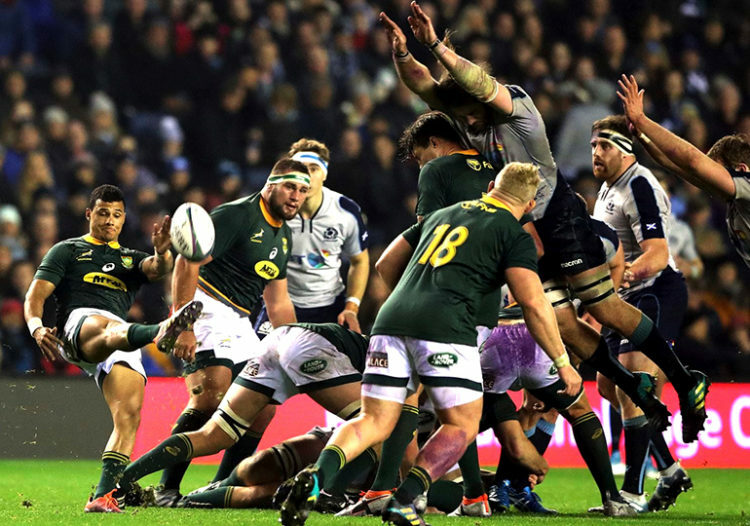 Coach Rassie Erasmus has every right to praise the Boks’ growing maturity following their six-point victory over a good Scotland side that have made Murrayfield a fortress. The Scots, praised by many for their “brave” ball-in-hand approach, will be ruing a few of their calls to try and run themselves out of their 22. They made more carries, more metres per carry, more linebreaks, many more passes – most of which were deemed good – and more offloads than the visiting side. But as is the case with more than 90% of games these days, went on to lose the game! Using their halfbacks to kick (Embrose Papier 10, Handre Pollard 8), the Boks managed the game better than their hosts, carving off 644 metres from a team total of 25 kicks, three more than Scotland. But it wasn’t only via the boot where the Bok 9 and 10 were superior. Pollard (9) and Papier (8) topped the carry stats alongside the remarkable engine that is Pieter-Steph du Toit, to round off a very solid performance from the Bulls halfback pairing. Speaking of Du Toit, he was part of a loose trio that was a whole lot more effective than the one that did duty against France last week. The Scots may have won 6 more rucks than the Boks, but they lost 8, while the men in green lost none! And come maul time, it was again the visitors who forced the Scots into losing two of those. Throw in the 11 turnovers conceded by the haggis-munchers, and that is probably the game lost right there. Good assessment of the game. Tank should be writing for one of the mainstream media companies. So tired of the same old same old drivel from some of the old school journos. I would be interested to get Tanks opinion on the fatigue factor. All our games have been nail biters and we saw the AB’s getting beaten by Ireland. Is it fatigue or is there a changing of the guard SH versus NH? Thanks John. Appreciate the feedback. I think fatigue plays it’s part on both the EOY tours by the SA sides, and the June tours South by the NH sides. But given that players are happy to spend their off seasons earning cash in the NH (Van Zyl, the Du preez brothers), it’s a bit flippen difficult to start on the fatigue train! But at the end of a season, in the 4th week of a tour, it’s certainly not easy. But i do think the NH sides have more than “Caught up” with the SH sides. But in today’s game, being very well conditioned, and having an incredibly organised defence will keep you in most games!! i wouldn’t say changing of the guard. i think this changing of guard has been mentioned very cheaply by many. it takes a lot of ingredients to topple strongholds (South Africa, New Zealand and Australia). Rugby has been played for over 100 years. In fact even in other sports that these three are involved in. eg cricket, netball, hockey etc. These three strongholds (nations) of sports have been proven year in year out to be able to produce great players and great teams. Ireland can even be number 1. Even Italy can suddenly turn and be very competitive like Scotland. as Rugby fans we would love that. but that doesn’t mean they have arrived . This thing is in the blood. to win is written in the DNA of SH giants. they expect to win always. That is why they can rise from the dead so quickly and dominate. if the NH can dominate for the next 20 years then we can talk about a change of guard. in those 20 years they would have to remove the fear of the SH giants. they will have to deposit fear in the hearts of the SH giants and remove their belief of winning. they would have to establish an ability to continua-sly win in the SH. they would have to produce great players ant teams year in and year out. they would have to at list win 60% of the time against the SH giants etc. why do u think America has dominated in a lot of things in the World except rugby and Cricket ofcoz. that is because American came from United Kingdom. they have the DNA of UK. Like father like son. they dominate economies, politics, tv etc. just like the UK nations. DNA works wherever you are. the scotland commentators were amazed at how the boks have managed to turn last year to what they are now. i was not. i expected it. we are the boks. i say that with all humbleness. you see that is the attitude of all SH. that is hard to beat. rugby is ATTITUDE. by there way how come the SH still wins away with all their players not available. like those playing in the NH. n the NH nations has all their players available. i wonder. There are over 125,000 players registered with USA Rugby and 2500 clubs. Problem is that they only start playing in college in the US. That means that they generally have to import specialist for certain positions like nr10/9/front row etc. Some positions just require guys that grew up doing that job from a young age. That’s not to say that they cant be competitive against a traditional country. Just that they wont do so consistently. Once Rugby gets into the Olympics, you’ll start to see a major change. The type of funding they get for that in the USA is astronomical. Rugby would do well in US schools. Its a much more inclusive sport like soccer. American school football is generally reserved for the top athletes while in Rugby they’ll find you a spot in a lower team even if you’re not that good (like myself) Problem is to keep the soccer moms happy with kids running around without helmets. The safety equipment in football actually makes the game less safe IMHO. Well then Mr Chris. Lets pray that they allow Rugby to be played in Olympics. The USA is a big market. Them getting a lot of funding and being highly competitive would really be good for the sport. Japan has bought into the sport big time. We now need USA more n maybe India (lol). *There will be more money in the sport. *Even the officials will make more money. The officials should be aggressive in getting the USA highly involved in this sport. i just pray and hope that our beloved Rugby doesn’t become like soccer were league teams are more respected than national teams. Hmm, you were humming along nicely until you said the USA follows the UK – it’s in their DNA. It is the USA that threw off the colonial cloak, it’s the USA that kicked the ‘rooinekke’ out of their country, it is the USA that created capitalism – and it is capitalism, the need (greed?) for income that will propel the USA to the top of the rugby world in maybe 12 years time … because the money is coming. I watch my rugby on a channel devoted solely rugby (FLORUGBY) and rugby is the fastest growing sport in the USA, currently the largest economy in the world … and their rankings just climbed again – now at 13 under Gary Gold. Just five years ago, I had to find a scumbag channel littered with viruses to watch my rugby, now ESPN is selling advertising on rugby games, as is FLORUGBY … and the game is so natural to Americans, they love the aggression, the ethos, the respect and the reality of it. “I fear we have woken a sleeping giant” Adm Yamamoto after the successful attack on Pearl Harbor. hahahaha Mr William i love you man. We actually agree hey. by DNA i mean since USA was formed by people who come from United Kingdom. that means they have the ability to dominate just like the UK dominated the the world through colonialism. as you rightfully said, the USA is now dominating through capitalism. Sons in many cases do better than their fathers. so the USA is doing better than the UK in dominating the World. sons are also suppose to break from their fathers house and make their own home. hence the USA broke away from the rule of the Queen who is their mother. Now about the USA growing in Rugby. i agree with you they will be very strong and have the potential to compete highly with the very best. they have well developed structures. a people that love sport. they have the money to employ the best Coaches from SA or NZ. but u must never forget that SA, NZ and AUS have been playing Rugby successfully for 100 years now. it will take a lot more to topple those guys. they are what we call mainstays. when all else has come and gone they remain. and remember the USA was formed directly by people who came from UK. other countries were just colonised by the UK but not formed. so the USA colonialism was different. it was family colonising family. Considering prior years and how different this year’s end of tour has been, with not much difference in the SH season, I’d wager its a case of everybody catching up, including us, considering during the same season we ran NZ all the way in both our games too. Yep,—-just dont tell the doomsayers. Thanks Tank! It was refreshing to see Pollard take control of the game the way he did,I was not sure what excactly Rassie’s plan with Papier was, it seems it paid off. Both Van Zyl and Papier had solid performances starting on this tour which is a good sign! It does seem that this is the loose trio that’ll have to do the business come RWC time. How much gas is left in the tank to finish off Wales? Kollisi looks tired, maybe start with Flo and give our skip some rest with Duane taking over the captaincy against Wales? Shot Vossie. Yep, I think this Bok side is an outside pass or two from Pollard and De Allende from firing properly. Hence the inconsistency. Great to see that we have more in the scrummie closet than just Faf, and I tell you what, Schreuder would fit in just fine with Pollard at 10. Spot on re the loose trio, though. Tricky “Accomodating” Siya, but I think it’s worth as he adds so much value as skipper. So starting this trio seems the best option, with a proper fetcher like Flo coming on for a full 30. Switching PSdT to lock for the final 20 also gives the Boks a lekker option of bringing on a thumper at 7. But we must be weary of playing PSdT into the ground!! We think alike,–the only real problems I have seen with the Boks is that midfield and the odd concentration lapse. That scrum and its bench are potentially the best in the world. The wings and fullback same (slight worry about Willemse), -even Pollard with Jantjies and Papier backing up FAF have come on in leaps and bounds. The only weakness is in the midfield,–like I say, ONE personnel change away from being a really good side. I would agree with you, Kolisi has been off his best, but was way better this week in terms of leadership and attitude, than the previous two. I just wonder whether he does not feel a bit cramped with a number of other aspiring leaders in the team? There was no Etzebeth or Whitely this week? One of the biggest assets we have is our fairly extensive volume of good players – we just keep churning them out. So whilst the North may this year seem to have made up ground, they are fairly vulnerable when it comes to depth. England is a fairly good example – they have been ravaged of recent. Ireland similarly have fair depth in their forwards, but their centres are relatively inexperienced and they would be in trouble if they lost any of 9,10 or 15. It really brought this point home, when I watched the earlier premiership games Saracens Vs Sale. Faf de klerk was back on song and he was accompanied at 10 by Rob Du Preez, who had a blinder Kicking 20 of the visitors 25 points. Next week they will likely have Rohan Janse Van Rensberg at 12 and Jean-Luc Du Preez at 7! We are really spoilt for choice – any of these guys would not have been out of place in the later fixture against Scotland! We need to add some more metrics to these stats IMHO. Meters/Nrs balls kicked for example. That’s a pretty useless nr. as it does not indicate at all if the kicking was effective or not. Did the kick go out ? Did it find dead space or lead to a counter attack ? did the kicking team regain possession ? What area of the field was it kicked in/out. metres gained etc. etc. Maybe we could add some more values to the distance nr’s to come up with a score that reflects the effectiveness of the kicking game employed. After all, its arguably the most important stat of any game. So Tank what you are actually saying is that dom krag rules. Yeah right. Imo you are inflating the manner of this victory by saying 90% of games are won these days with a conservative approach. I will challenge that by saying 90% of the games are won by the team scoring the most tries and the way to do that is to ensure that your game plan and player skills are good enough to outscore the opposition. The Irish try was a typical example. The wing had the vision and the skill to kick ahead and executed magnificently. Now where did he get those skills ? Playing in the Pro 14 each week where the Irish teams like Leinster play expansively week in and week out and the player then reacts instinctively to the opportunity. This becomes even more important in the tight games. But in the Bok’s case what has been the biggest lament by posters and panel discussion shows win or lose.? The decided lack of skills and vision with proper execution a particular problem. Why’s that ? Between Pollard, DDA and Kriel our dynamic wings have become mere appendages on the field. The only creative back has been Willie and between him and Faf they ignored Rassie’s dom krag game plan against the Engelse in SA and we ran our way out of trouble, saving Rassie’s bacon. Scotland ignored three kickable penalties going for the corner instead without success. You now take that as confirmation that being bold is the dumb option. So let’s say that Scotland have lost only two games at home from 11 starts which means by playing the bold way they in fact won 80% of their games with that direct approach. The AB’s have a 92% win ratio playing that way and even our much maligned Lions do so regularly in SR. The Lions our leading SR% team and AB’s still worlds No 1. See the pattern here ? The Boks on the other hand with their win one lose one habit however believe like most of the dom krag supporters on this forum that no frills, defence, no offloads and no vision will get you to the top. Just watch the Japan / England game. The midgets held their own in the scrums most of the time, they played a high tempo sublime ball in hand approach and gave England a lekker skrik. That my friend is the difference. Remember also the Miracle of Brighton when the Japanese took on the might of HM’s dom krag brigade and beat them ? An aberration I know but proving it can be done. No Sir when are we going to change course in this country ?. Scribes like yourself make no bones about your preferred way forward but it has brought us no success these past 9 years. Rassie’s loss ratio this year ( 6 ) is still worse than AC’s last year ( 4 ) if truth be told. We fall into the trap of praising mediocrity and accept winning plus minus 50% of our games as progress. In any other era of Bok rugby would that have been considered successful ? I think not. Cheers.